Eve 6 (sometimes typeset as EVE 6 or EVƎ 6) is an American rock band from Southern California, who are most well known for their hit singles "Inside Out" and "Here's to the Night". They disbanded in 2004, returned in 2007 with a new lineup, and finally reunited with all three original members in March 2011. They announced their signing to Fearless Records on May 3, 2011. When he was a senior at La Crescenta Valley High School in Los Angeles, Max Collins's classmates voted him "Most Likely to Be a Rock Star." They should have been as dead-on with their answers for the S.A.T. Such an honor didn't come out of the blue, of course. By that time Collins and his friend and bandmate John Siebels were already signed to a major-label recording contract. While friends were flipping burgers or struggling with their poly-sci homework, Collins and Siebels (plus a drummer with whom they later parted ways) were writing songs, practicing, and playing gigs at coffeehouses, parties, and bars where they were too young to buy a drink. There's almost always a catch in recording contracts, of course. Theirs was no exception, but it turned out to be one they could live with. Their label, RCA Records, told them they had to graduate, or the deal was off. "I guess they saw potential and wanted to let us develop on our own and finish high school," Collins says of the label. "That was an awesome thing. I think few record companies would give that kind of a chance to a young act." RCA's conditional contract may have prevented them from making an album at the time, but Collins now says it was the right thing to do. "I think after the first year went by and we were still playing the same coffee shops and didn't have a record out it was kind of frustrating. And we wished we could have done it right then and there. But in retrospect, it's so good that we didn't. It would have been a bad idea for us to record a major-label record when we were still in high school." Collins and Siebels's partnership can be traced back to 1993, when Collins was a suburban kid growing up listening to then-popular hair metal bands like Skid Row and Poison. His world was rocked, however, when he was at skateboarding camp and discovered punk rock in the form of bands like the Dead Kennedys and the Descendants. "The whole skateboarding-music thing, there was identity in that," he told the New York Post. Collins began playing bass guitar and jamming with guitarist Siebels and their drummer. When they played their crucial showcase for some artist and repertoire (A&R) executives from RCA, Collins recalls it was "horribly messy," but the label demonstrated faith in their abilities anyway. "They really let us do our thing and develop on our own," Siebels says. "It was nice for us, as juniors and seniors in high school, to not worry about working horrible jobs so we could concentrate on songwriting." Just before graduation, their drummer left the band. Enter Tony Fagenson, a college student at the time, and not incidentally, the son of record producer Don Was (who had worked with Bob Dylan, the Rolling Stones, Bonnie Raitt, Garth Brooks, and others). Fagenson completed the lineup, but by Collins's way of thinking, one more adjustment was needed. Up to that point the band had been known as Eleventeen. Collins suggested a name change so they wouldn't be mistaken for a teenybopper group. The moniker they chose instead--Eve 6--may have thrown them in with a dizzying array of "number bands" (Blink 182, matchbox twenty, 311, et al), but there was also a story behind their choice. They took the name from an episode of "The X-Files" in which a psych ward patient bites her guard's eyeball right out of its socket. Eve 6 finally got the chance to record in 1998, when they made their self-titled debut album. An engaging mix of snarling guitars, hard-charging rhythms, and Collins's emphatic vocals, Eve 6 turned out to be the most potent punk-pop concoction this side of Green Day. The album clocks in at only 40 minutes--short in this age of overlong CDs--but hit singles "Inside Out" and "Leech" (abetted by the usual spate of endless touring) drove sales to more than a million copies. Another thing that separated Eve 6 from the rest of the punk-pop pack was Collins's surprisingly erudite lyrics. Collins maintained an interest in acts such as Elvis Costello, the Pixies, and Jawbreaker, who helped him discover that it was possible to match catchy melodies with words that went beyond the usual concerns of songwriters his age. "Drag this neurotic to hysterics/Leave him balked and unfulfilled," goes the first line of "How Much Longer," the lead track on Eve 6. The rest of the album follows in a similar vein. Having struck platinum their first time out, you'd think the trio would feel a certain amount of pressure to top that effort commercially. However, Fagenson revealed in RCA's promotional materials, "Any time a band has a hit they think, 'Well, we want to keep our career going. We have to write another hit.' But we didn't go into recording the album with that mindset at all. We went in thinking, 'Let's pretend we're starting over, that this is our first chance to make an album.'" To that end, the band tried to expand their musical horizons a bit, going beyond the work of their favorite artists to find a fresh perspective. "I moved away from the sort of pop-punk that I've always listened to and started listening to electronica, some rap records," Siebels said in RCA's promotional materials. "I think that's definitely had some influences on our [new] record." That new record, Horrorscope, was released in 2000. The idea this time was to refine their sound a bit, adding layers of instrumentation to give the disc a more sophisticated and polished sound. "We learned so much from the past two years about recording and touring and just being in a band," Collins told Billboard. "So we had a much firmer grasp of what we wanted, and the songs mesh well with each other." They also wanted to show off another aspect of their collective personality they feel didn't come out on the first album: their sense of humor. "I think that with our first record, we came off as very serious," Siebels says. "But there's a side of us that really doesn't take ourselves seriously and makes jokes out of everything. But now we found a happy medium and people are going to see the lighter side of us this time around." That's not true of all the material on Horrorscope, however. The song "Nightmare," for example, is about the frustration and confusion of establishing a self-identity. "Enemy" is about Collins's harrowing experience of going to get an HIV test. "I was thinking about it a lot, worrying about it a lot, and finally got the courage to go ahead and do it," he told CosmoGIRL!. "I was so relieved when the test came back negative." "On the Roof Again," meanwhile, is a song about a friend's suicidal despair, though it does take a slightly flip approach lyrically. "Songs you hear on the radio these days sound so serious to the point of pretention," Collins told Billboard. "So I tried to throw in a twist of fun this time--even if it's a pretty weighty subject." The album's hit single turned out to be "Promise," a song that was actually written right after the band finished their first record, but before they went on the road. "It's pretty much what you've come to expect from Eve 6 but a whole lot better," Fagenson says. "We're very confident with this record; we've grown and matured quite a bit as people, as well as musicians." That doesn't mean their live shows have become any less spontaneous or fun. Indeed, the trio (joined by Fagenson's cousin Gabe on bass to allow Collins to concentrate on singing) has become known for mixing crazy covers, including punk rock versions of Peter, Paul & Mary's "Leaving on a Jet Plane" and TLC's "Waterfalls," into their standard set. "You really can't complain when you get to play in front of thousands of people every night that are digging your sh*t and understanding what you're trying to do," Fagenson says. "If we can do that forever then we'll be very happy." 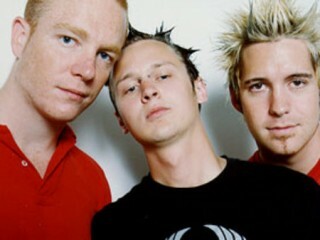 View the full website biography of Eve 6.